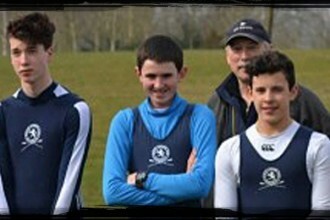 On 28th January Henley Junior Crews competed at Quintin Head. This is a 5k head race on the Tideway for 250 eights raced on part of the Boat Race course from Hammersmith Bridge to above Chiswick Bridge. The Tideway is significantly different from the local Henley reach and for the younger crews this event gives them the opportunity to experience the Tideway before the major events in a few weeks time of the Schools Head, Womens Head and The Head of the River. Conditions on the day were good with only the wind causing a little difficulty as the crews came round the bend from Chiswick Pier to Barnes. Three Henley crews competed and returned with one win and two second places. 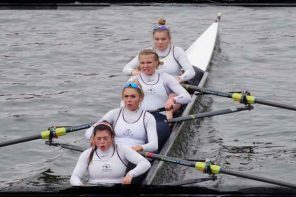 The winning crew was the experienced WJ18 crew of Amy Sotnick, Phyllis Barter, Tilly Lock, Alice Jones, Alicia Redman, Daisy Butterworth, Grace Johnson, Rebecca Lister and cox Freya Reid. All with the exception of Daisy (who only started rowing this year) have raced the Tideway on numerous occasions. Knowing the course is an advantage particularly for coxes as being out of the stream will cause the boat to lose significant speed. The second place crew, St Pauls Girls’ School, had a home advantage as the Tideway is their training ground, but despite this advantage the Henley girls beat them by a good six seconds to record the Clubs first win of 2017. For the Girls WJ15 eight, Jess Roberts, Hannah Hills, Georgia Brown, Carla Russell, Amber Weller, Amy Howard, Phoebe Snowden, Hazel Drury, and cox Hugo Rompani this was their first experience of the tideway. The girls did struggle a little with the way conditions changed as the course came round the Hammersmith bend and the wind changed from a cross tail to a cross head. Despite this they finished second to a tideway crew Latymer Upper and beat a number of other tideway crews the Putney High School crew in third place being nearly a minute behind the Henley girls. 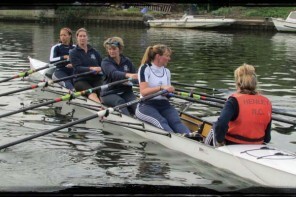 The girls time would also have seen them comfortably winning the older J16 category.